While we were road tripping in the south, I felt compelled to find a border city in Tennessee. 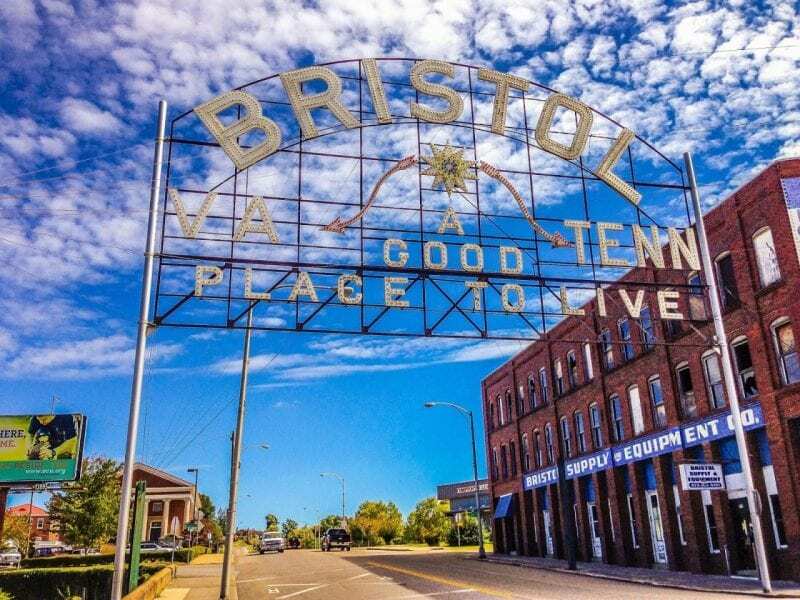 In this instance, the chosen place turned out to be Bristol, Tennessee and its twin city of Bristol, Virginia. I’d visited both states before but was powerless to resist the temptation to visit them both at the *same time*. The twin cities share a state line, which runs along the aptly named ‘State Street’ in the shared Downtown district. Luckily, there’s no time difference between the states, or that would just be too mind-blowing. It must be confusing enough living in one state with all rules and regulations and then popping across the road to another state and finding things are a bit different, despite the fact that you’ve only taken ten steps. I imagine living in Virginia and leaving the house one day. ‘Where you off to?’ LT would ask. ‘Oh, we’re out of milk, so I’m just popping over to Tennessee to go get some…’ Or something like that. Both cities look similar (obviously) and are joined by a fabulously massive overhead sign telling you that either one is a good place to live. Bristol, VA is officially known for being the birthplace of country music as the first recordings were made here. Bristol, Tennessee boasts the world’s fastest half-mile track, which is in the local Speedway. Personally, I was relieved that they both had claims to fame. I imagined all kinds of petty jealousy caused by one being famous for tons of stuff while the other had missed out on everything due to being a few yards further away. That would be rather annoying for the local tourist board on the other side. As it happens, this is not a problem as they clearly work well together to promote the fact that they’re both as similar as they are different. After arriving in Bristol, Tennessee, we had to stop by and check out the Speedway. 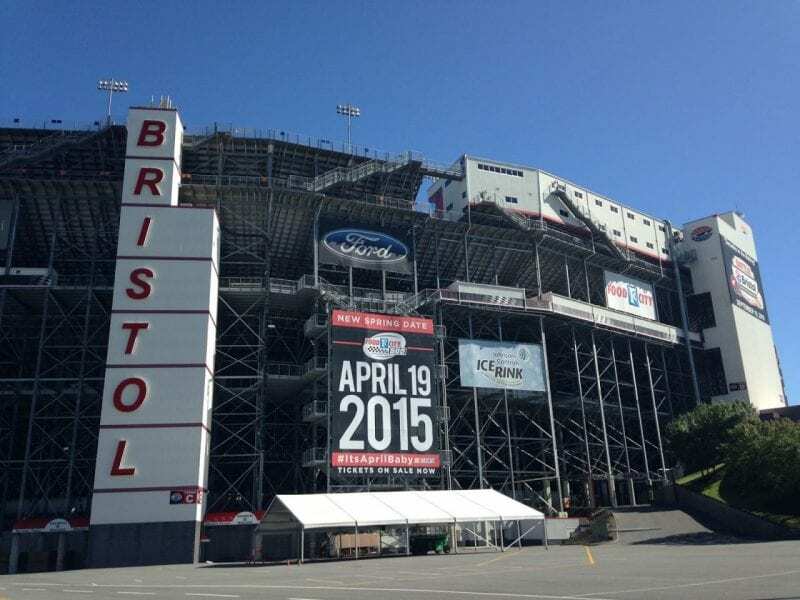 Bristol Motor Speedway is the 4th largest sports venue in the US and 8th largest in the world. That’s a pretty impressive statistic and the venue can seat 160,000 people. Parking must be a right headache when it’s busy. It’s famous for hosting NASCAR events, amongst others. Bristol Speedway is also famous for being used to shoot scenes for the Tom Cruise movie, ‘Days of Thunder’, as well as being the inspiration for the racing track in Disney Pixar’s ‘Cars’. I loved one of those movies. Lightning McQueen is such a BOSS. Heading on from the track, we entered the Downtown area. We parked up in what may have been Tennessee, or possibly Virginia, but most definitely one of the two. The wonderful thing about Downtown Bristol is that it’s retained its old world charm. It has a lovely collection of restaurants, bars and antique shops with gorgeous window displays and friendly natives. It’s a great area to walk and, should you get peckish, there’s an abundance of options to choose from. Never one to be far from hunger, LT spied a Quaker Steak and Lube on State and, with the tempting smell of baby back ribs in his nostrils, we ventured in. At this point, he hadn’t eaten in, ooh, at least an hour and so Lunch Time was declared. After filling up the tank, we wandered some more and realised that there was so much to do in Bristol. We stopped by the Paramount Theater and City Hall and generally enjoyed the sunshine and atmosphere. Both cities are so peaceful and pretty and the slogan ‘A Great Place To Live’ really seems to be true. Have you stood across the state lines in Bristol, Tennessee and Virginia?